pssmitty papercrafts: 17 years ago! Well here we are! The upper left picture was 17 years ago when we traveled to Phoenix International Raceway to attend the NASCAR events. One week later we flew to Las Vegas & got married! Over the years we have returned to Phoenix several times to see the races. Picture bottom left is one of our many camping trips at the track! 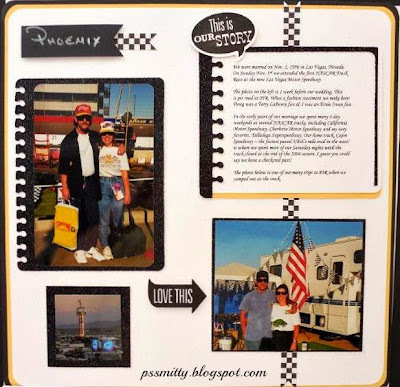 Scrapbooking has let me preserve these memories so they can be enjoyed over & over! I hope you are preserving your heartwarming memories too! Saturday - Oct 19th - Craft Fair - Santee! Holidays from the Heart! NEW 21 page catalog!